It happens to the best of us. Spots. Stains. Blotches. Obnoxious, yellowed collars and armpits. But for me…it only started happening recently. As a kid, I could wear the same white t-shirts and turtlenecks for years and years because they somehow stayed untainted, and white as snow. My mom still marvels over it to this day. Stain-free. A 4-year old. Keeping her whites white. My younger sister though...Lord bless her. Her clothes consisted of greys and darks because her whites didn't last past breakfast. 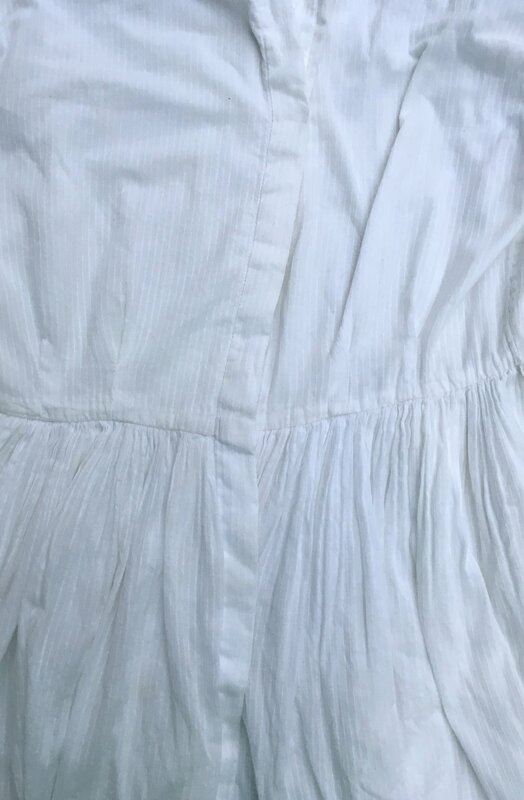 All my pristine white hand-me-downs? Stained in one day flat. I always thought I inherited some perfect-child gene that skipped her. Until…recently. As I thought about sharing with you this magic trick, I realized something. I have, in fact, devolved when it comes to staying clean. 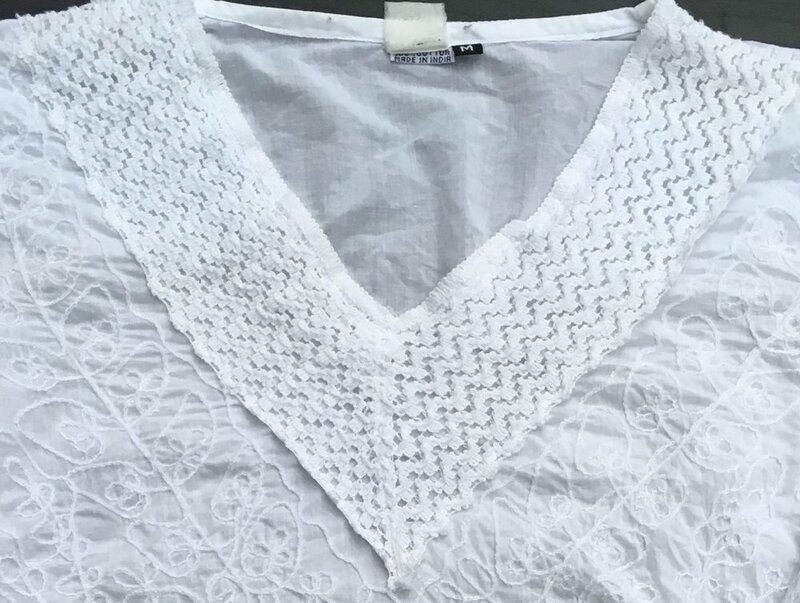 As I became a young adult and now as a regular adult…I've noticed that my white clothes don't seem to make it past breakfast. Literally. My coffee, tea, green smoothies - all tend to end up on my lap, my chest, my sleeve. Even my maxi skirt hems. What the heck. So - guess that means it wasn't genetic. Maybe staying tidy was a phase I grew out of. My sister may have grown into that phase, but I’ve grown out of it. In a serious way. 3 laundering attempts + bleach. I used everything in my highschool and college years, when this problem emerged. And, was largely disappointed. Not for me, at least. 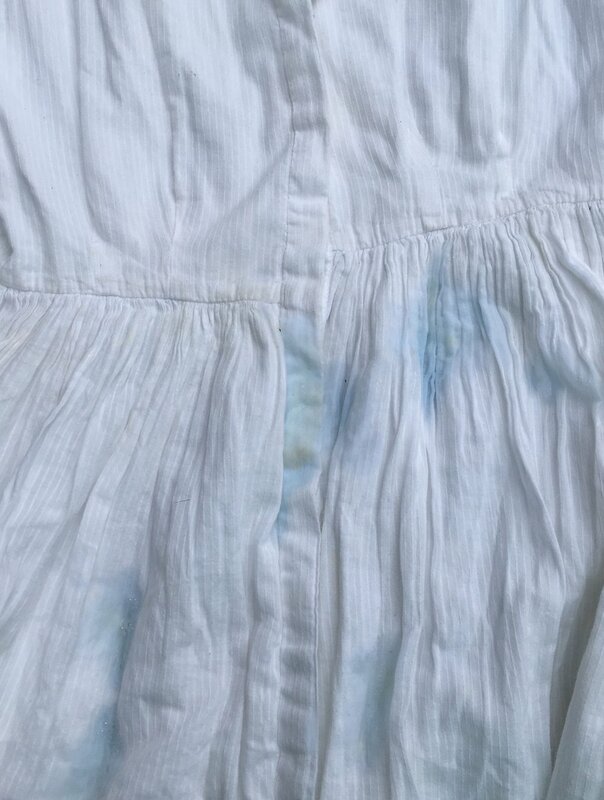 Most of the time, the stains I really want gone never really left. Especially those annoying sweat stains. EEWW... seriously embarrassing. or chemically weakened and thinned the fabric as I scrubbed. I tried them all. Not even Billy Mays' OxiClean could combat the tea, sweat, and random yellow spots that would appear. All that "toxic" for barely any progress? No thanks. Click the links above to check out the safety ratings for each of those products....NOT encouraging! 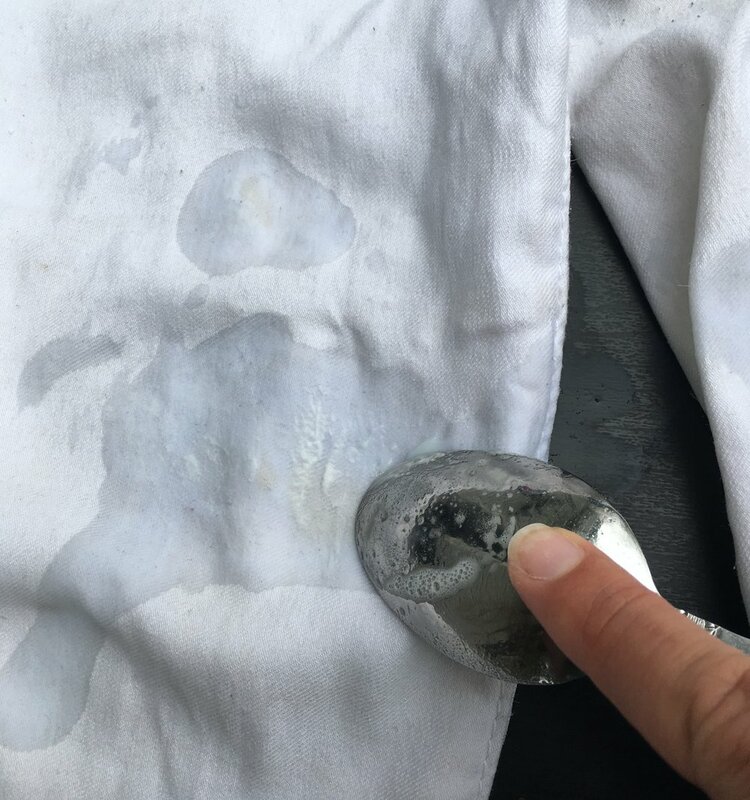 So given that once I had my own household to run and pick products for, I neither wanted stains on my whites, nor did I want to breathe toxic fumes or absorb them through my skin. So then...what's a stain-prone girl to do? 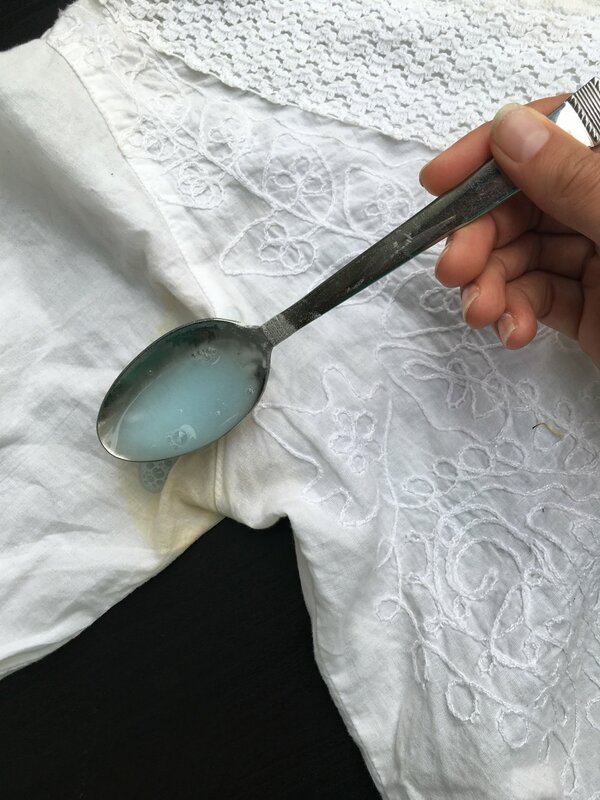 This Magic Spot Removal Paste linked from My Life In Pink & Green is the key to stain-free clothes I wish I'd known all along. WITHOUT the scary ingredients. Disclaimer: While my default personality tendency is not to air my dirty laundry in front of people, (because, I kind of like to be "put together")...I figured, this whole social media world all just a sham anyways. We're all just real humans, messy, emotional, and in need of real truth and photographic evidence to prove it...no matter how sweat-stained the package may be. So here you go! Now. I will say... as far as trying to have a TOTALLY chemical free home, Dawn is an offender. Because...I eat off my dishes, and the residue is absolutely still on those dishes as I lick and drink and cook. I switched to only buying dish liquid without Sodium Laureth Sulfate or any "Fragrance" (that's French for "secret recipe of toxins"). Mix to form a paste, and scrub into spots with a spoon or old toothbrush. Let sit for half an hour, then wash as usual. Here are some before-and-after shots.